Asher Senator is a veteran UK MC stemming back from the eighties. He has generated success with his lyrical prowess with his late and great long term sparring partner Smiley Culture on sound systems such as Buchanan, Sir Coxsone, Front Line and Saxon. He has produced number 1 singles and albums in the UK Reggae Charts and has toured around the world especially in diverse countries such as Russia, Latvia and French Guyana. For more info on Asher Senator feel free to tap his name into Google and You Tube and witness for yourself the excellence he provides in his lyrics. Asher has just finished writing and publishing his first book entitled ‘Smiley & Me’ which captures his life long friendship and journey in the music industry along with Smiley Culture. Get your copy quickly at www.vitowmedia.com to guarantee that you get one of the original copies before it reaches the wider commercial market and changes its format. 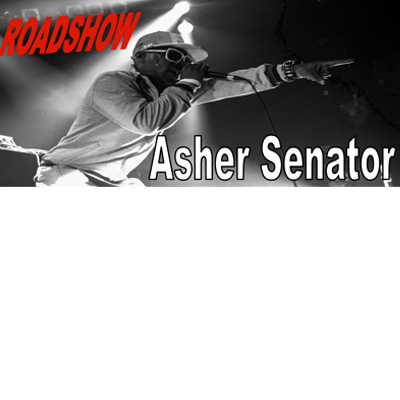 Right now Asher is touring again, but this time with a big difference. ROADSHOW Asher Senator is a discotheque style system that entertains with music of all sorts, depending on the audience, and plays at all types of venues.